1. The design of it is very fashionable, and we focus on it’s security when designing it. It adopts ergonomic principles, with large internal space, which makes it easy to operate and comfortable to wear. Wearing it can protect all-sidely our face, neck, ears and so on. 2. liquid crystal of high quality, optical coating, and protection for sheilding ultraviolet and infrared rays(level of protection: 15#) are adopted to protect welding operator from being injured by harmful rays such as ultraviolet rays, infrared rays, etc. 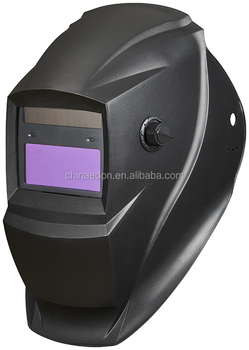 3. liquid crystal light valve adopts the brand new techonology of automatically changing the light controlled by light, multilayer LCD and coated glass effectively stop ultraviolet and infrared rays and let the visible light through easily so as to protect the eyes of the operator, and enable him to observe welding object clealy, thus reducing repeaed welding, and improve efficiency. 4. The original design of automatic transform technology used in controlling circuit make it possible for goggles to be able to react to the arc in 1/10000 second and change strong light to dark light.As a result, it can protect our eyes from being injured by sudden arc. 5. The original design of Anti - interference switch avoids not seeing welding object clearly due to complex surroundings nearby. 6. The time of goggles’ changing dark light to strong light when arc disappears can be set within 0.1 second or 1.2 seconds as required.